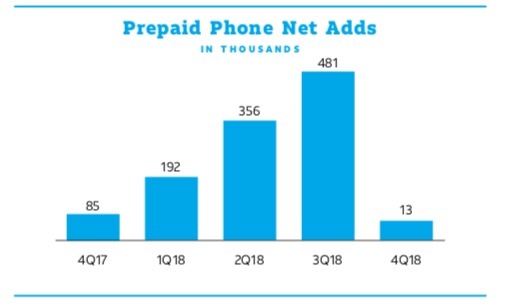 Just when you thought Sprint prepaid turned the loss corner in 2017, it started sputtering in 2Q18 and then totally tanked in 4Q19 with 174K net losses. Sprint bet big on prepaid in the Dan Hesse days and embarked on a multi-brand strategy. Then, Assurance, a lifeline brand created to counter America Movil's Safelink greatly added to the prepaid base. Then with the fallout of lifeline investigations, those numbers quickly went away. Meanwhile in 2017, under then CEO Claure, Sprint announced the re-launch of its limbo brand, Virgin Mobile. The new Virgin Mobile was supposed to be an "industry game-changer" with an iPhone only bent. It hasn't moved the needle in prepaid competition. Why it matters: Essentially, Sprint prepaid is a one brand pony - Boost. In the CY4Q18 earnings call and material, Sprint noted that Boost continues to be a strong contender. In the previous quarter, Boost accounted for <200K net additions. For this quarter, rather than provide a definitive number, Sprint CEO Combes only stated that Boost delivered eight consecutive quarters before "migration." Migration? What's that? In a nutshell, Sprint has identified high-value and stable Boost or Virgin Mobile subscribers and offer them a non-branded Sprint postpaid plan and device financing. For this quarter they totaled 100K, which also classified them in the Sprint postpaid subscriber base. In CY3Q18, Combes managed expectations that this quarter would be negative. One can only assume that Virgin Mobile is the brand that is in a freefall since Sprint no longer reports Lifeline (Assurance) subs due to regulatory constraints. 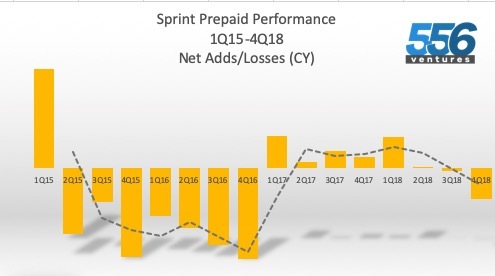 However, Sprint expects a return to growth in CY1Q19/FY4Q18. Even if Sprint prepaid bounces back, it will be a while before it matches the momentum of AT&T Cricket or Metro by T-Mobile. 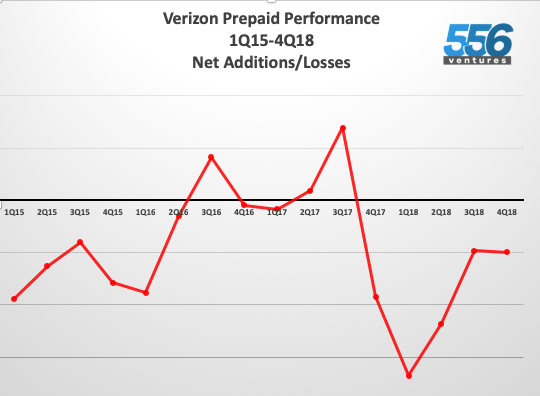 Verizon prepaid has steadily lost subscribers over the many quarters. For 4Q18 the carrier lost 90,000 subscribers, 3K more than last quarter. This performance, on the surface, is disturbing for any student of business. 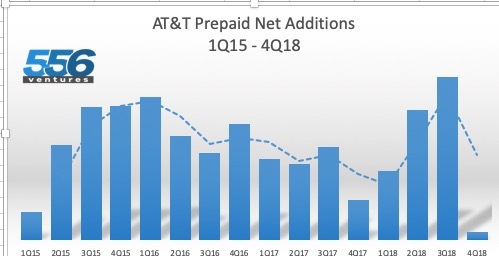 In the 3Q18 earnings call, CFO Ellis stated, "..prepaid is certainly a small part of our business. And we will continue to evolve and adapt the product offering there over time." The company was to focus the prepaid offerings on value-added segments. The 4Q18 results suggest it's either not working or still a work in process into 2019. Why it doesn't matter: Verizon's retail subscriber base is now nearly 118 million subscribers of which the prepaid base is about 4.6 million. That's less than 4% of the overall retail subscribers. Even though the prepaid group had been north of 5 million, the postpaid side is where the money is at. In contrast, the postpaid subscriber net additions exceeded 1.2 million. In the end for prepaid competition, Verizon as a brand, while strong force in postpaid is a non-contender in prepaid. When I spent time at my old company, Current Analysis, the value to the customer base on quick analysis was brevity and competitive impact. We wrote (at the time) very short but meaningful opinions and analyses on events (announcements, plan changes) on the competitive landscape.